1. 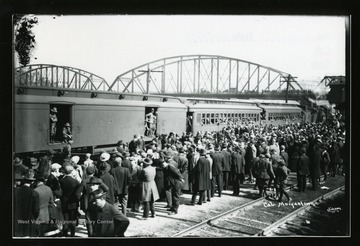 Company L Leaving Morgantown for Mobilization, Morgantown, W. Va.
Company L Leaving Morgantown for Mobilization, Morgantown, W. Va.
2. Pulp Mill and Log Pond at Spruce, W. Va. 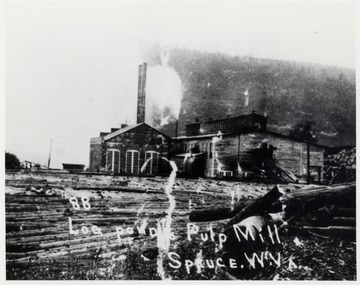 Pulp Mill and Log Pond at Spruce, W. Va.
3. 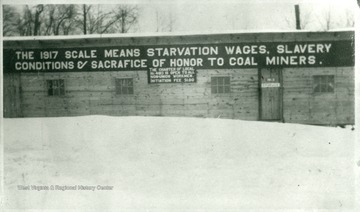 Barracks at Irona with 1917 Scale Protest Sign, Irona, W. Va.
Barracks at Irona with 1917 Scale Protest Sign, Irona, W. Va.
4. Woodson-Mohler Grocery Co. in Alderson, W. Va.
Woodson-Mohler Grocery Co. in Alderson, W. Va. 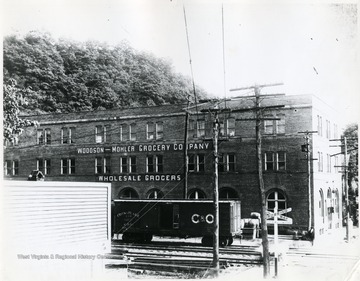 Frontal view of the Woodson - Mohler Grocery Co. Wholesale Grocers building in Alderson W. Va. with C&amp;O boxcar situated in front of building. 5. 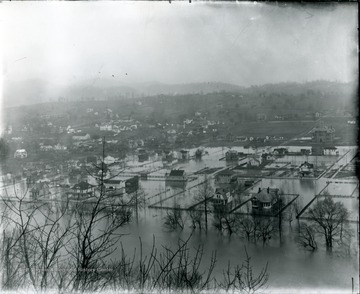 Flooded Areas of North Alderson, W. Va. Flooded Areas of North Alderson, W. Va.
6. 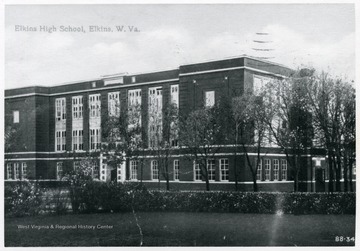 Elkins High School, Elkins, W.Va.
Elkins High School, Elkins, W.Va.
7. 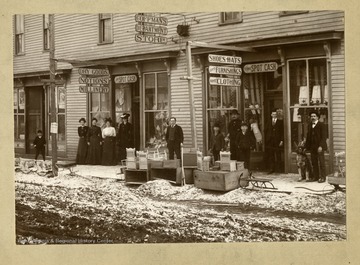 Coffman's Department Store, Elkins, W. Va.
Coffman's Department Store, Elkins, W. Va.
People and goods in front of George H. Coffman Store in Elkins, West Virginia; See W. Va. Gazeteers 1903-04; 1923-24. 8. 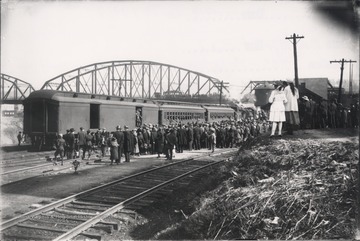 Company L Leaving Morgantown for Mobilization, Morgantown, W. Va.
9. Wrecked Boat on Monongahela River, Morgantown, W. Va. Wrecked Boat on Monongahela River, Morgantown, W. Va. 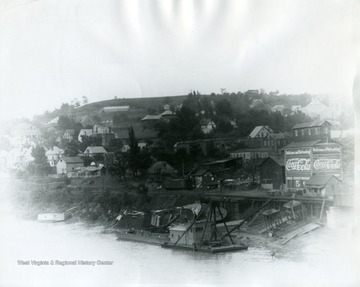 The wreckage of a boat lies on the river bank, at the foot of Walnut Street in Morgantown. 10. 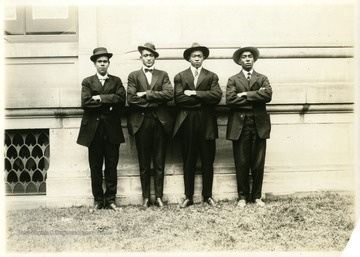 World War I Draftees, Morgantown, W. Va.
World War I Draftees, Morgantown, W. Va.
Four African-American World War I draftees in front of the post office. 11. 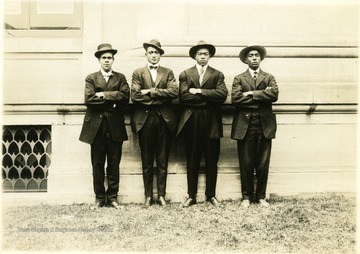 African-American World War I Draftees in Front of the Post Office, Morgantown, W. Va.
African-American World War I Draftees in Front of the Post Office, Morgantown, W. Va.
12. 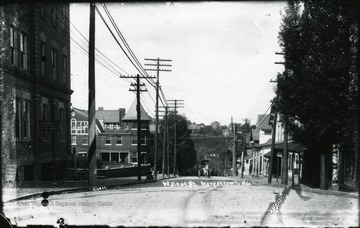 Walnut Street, Morgantown, W. Va.
Walnut Street, Morgantown, W. Va.